Use Newsletter2Go’s email marketing software to easily create as many contact groups as you’d like and segment email contacts. Contact groups are one of the best ways to segment email contacts into useful and powerful sub-categories. Filter all of your contacts according to one or more identifying traits, for example according to gender, registration date, purchase history, age and so on. The sky is the limit. That will allow you to specifically communicate with them from now on. 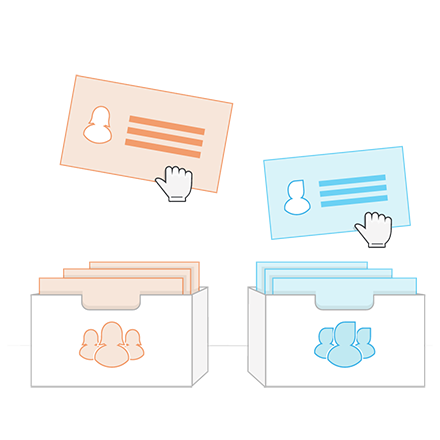 Use groups to segment your customer base and communicate more effectively. Achieve greater relevance email marketing by taking advantage of this powerful feature. Personalize your campaign messages with 1 click product transfer and 1 click content transfer. 1 click product transfer is a simple and effective tool at the same time. All you need to do is to enter the product number to copy the entire product into the newsletter. This will automatically transfer the product name, description, image, price and link to the product. Save time copying over individual elements and reformatting everything. Email contact groups with relevant products. 1 click content transfer works in a similar way. Transfer your site’s content into your newsletter simply by specifying the Post ID or Entity ID. Title, author, date, pictures and other attributes are then automatically synchronized. Save time and effort with the 1 Click Content Transfer: No more copying and pasting individual pieces of content, customizing or formatting images. Email contact groups with relevant content. Our newsletter software also offers a powerful professional email marketing feature: Auto-Update groups. These groups are based on either one or more identifying traits, and contacts who fulfill these conditions are automatically added to, and removed from, these groups. Learn more about our email marketing software. This reduces the manual effort when you’re segmenting your contacts, and makes sure that your address book and contact list are always up to date. Never worry about whether your contacts are receiving the right newsletters: with auto-update groups, the segmentation happens automatically and continually, as soon as you add a new contact into the system. Newsletter group management has never been so easy. Do you want to up for newsletter game? Check our free newsletter templates. How does target group segmentation work? How many recipient lists/group lists/segments/ can be created? Can I create multiple registration forms with multiple landing pages, opt-in emails and group classifications? Can all new subscribers be placed in a group, e.g. new subscribers? Is it also possible to add a particular user to a group via the API?